The vast Stöcken Industrial Park site near Hannover. 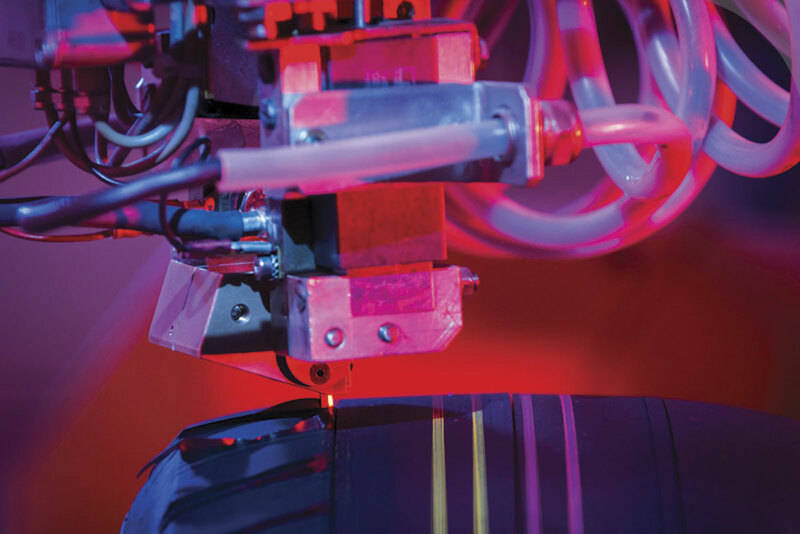 In the research department there are robot cutters that can be programmed by the skilled team to cut very precise sipe patterns into the rubber of tyres. A considerable variety of cutting tools is available. The components that make up a Conti PressureCheck system. Endurance testing tyres at Stöcken using a rotating drum. LtoR: The Conti Coach HA3 coach tyre, the Conti City Plus HA3 bus tyre, and the Conti Urban Scandinavia winter urban tyre. Continental is a long established name in rubber with origins that go all the way back to 1871. Until around 20 years ago, being number three in tyres and related services was the extent of its involvement in the automotive industry. Then it decided the way to growth was diversification, starting with the acquisition of ITT Braking Systems, and from there it has developed to the point that it is now an ‘international automotive supplier, tire manufacturer and industrial partner’, developing ‘intelligent technologies for transporting people and their goods’. For bus and coach operators, perhaps the best known other element of the Continental portfolio is the VDO tachograph business which has a very high proportion of the digital tachograph market. It now has five divisions, with the tyre side (which is still the biggest) joined by Chassis & Safety, Interior, Powertrain and ContiTech, all of which are active in the commercial vehicle sector. Together they achieved sales of €34.5billion (£25.61bn) in 2014 and are on target for €38bn (£28.2bn) in 2015, making it one of the top three automotive suppliers in the world. Worldwide 205,000 people are employed at 317 locations in 53 countries. It has stayed big in tyres, though these now represent only 28% of company turnover. Today it is in the top five rubber companies worldwide, as well as one of the top five tyre companies in Europe and NAFTA (including all tyre segments as well as original equipment & replacement). Within the tyre division there are six different units. These are: Commercial Vehicles; two wheel tyres; PLT (Passenger & Light Truck) original equipment; and separate PLT replacement business operations covering EMEA, the Americas and APAC. Commercial vehicle tyres, including those for buses, are produced at 12 plants worldwide, with most of those for Europe manufactured at the Czech and Slovakian facilities. Ten expansion projects across these plants will see up to €200m (£148.16m) invested annually in each of the next three years. 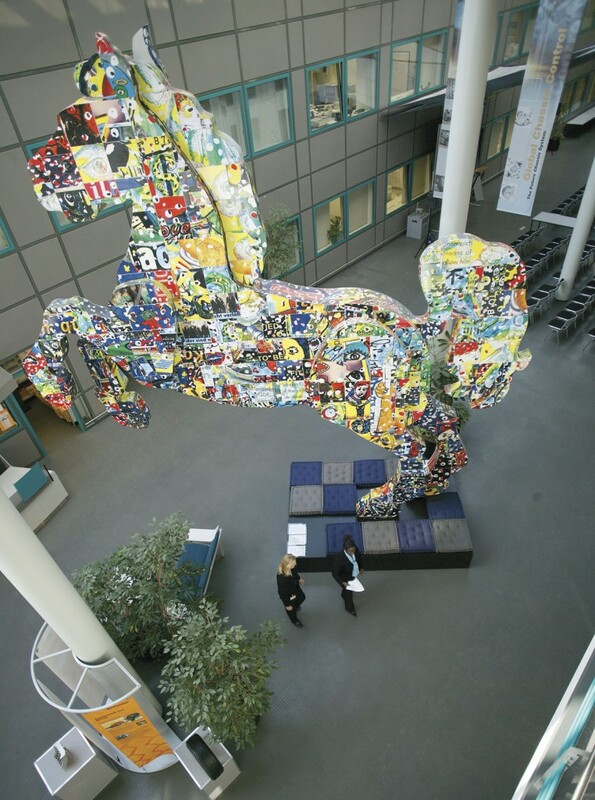 This massive and rather colourful take on the Continental horse symbol dominates the atrium at the Technology Centre. Last week I visited Continental’s headquarters in the Stöcken suburb of Hanover, to look at its research facility, its retread operation and to hear about its products including its tyre pressure monitoring systems. 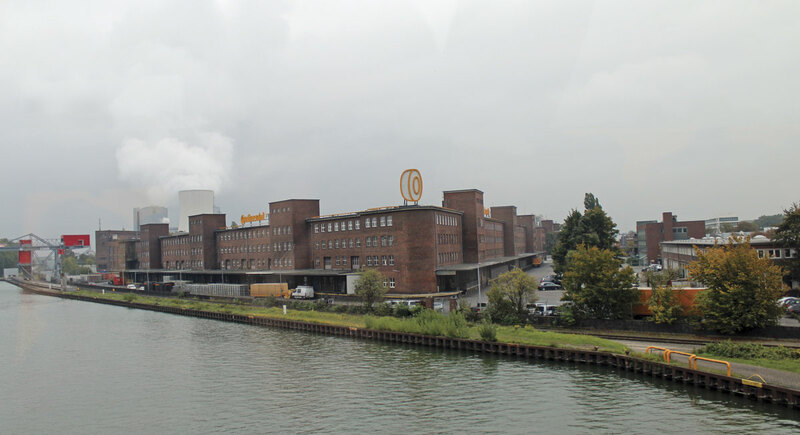 The Stöcken Industrial Park site, opened in 1938, is a huge one covering 500,000sq m and employing 3,900 people. Three of the five divisions are represented there, apart from Tyre (which the company spells Tire) there is the Contitech division’s Contitech Vibration Control operation and the Chassis & Safety Division. Constantin Batsch, Vice President Business Region Truck Tyres EMEA, said that Continental’s bus tyres were known for their excellent rolling resistance and mileage, maximum re-treadability and leading lowest overall driving costs. Pointing out that although tyres represented only 5% of the cost of running a bus or truck, they influenced 40% of a vehicle’s overall costs (fuel economy 30%, repair and maintenance 5%), he explained that Continental’s strategy was to move from being a tyre supplier to becoming a full solution provider, utilising smart ideas about what to do with all the data its systems collect. It has already begun the journey, by enlarging its scope, but there is still quite a way to go before its ambitions in this respect are fully achieved. Dr Franck Walloch, Head of Production Development Truck Tyres, a role that includes the development of bus tyres, explained that there were five stages in the development of a new tyre. It began with defining the development task and conducting a feasibility study to identify whether any new technology needed developing in order to produce the required tyre. Where possible, they try to use the same technologies for different applications. The second stage was to design the tyre using CAD (computer aided development) systems and then undertaking internal design verification, by which time prototype tyres would already have been produced. The fourth stage was external design verification, which included field tests, with the final stage being product industrialization and customer feedback. It was a circular process because the feedback gained was always used as part of the first stage of developing the next generation of products. Various forms of design validation and performance prediction are used, including simulation, laboratory, indoor (on a revolving drum), vehicle and field testing. There is a relationship between the type of testing and its effectiveness. Thus, while simulation and laboratory testing are quick, relatively cheap and provide valuable indications, it is only field testing, which takes far longer and costs more, that provides the full proof of a tyre’s performance. Developing a tyre is a question of balancing the different needs of safety, environment and economy to obtain the Lowest Overall Driving Cost (LODC). For economy the factors include: rolling resistance, mileage, minimum downtime, retreadability, robustness, durability and traction, while safety considerations include: wet braking, dry braking, wet handling, wet cornering, wet lifetime performance and grip amongst other things. For the environment, the concerns centre on external rolling noise, internal noise, retreadability and CO2 emissions. It also depends what you are trying to achieve. 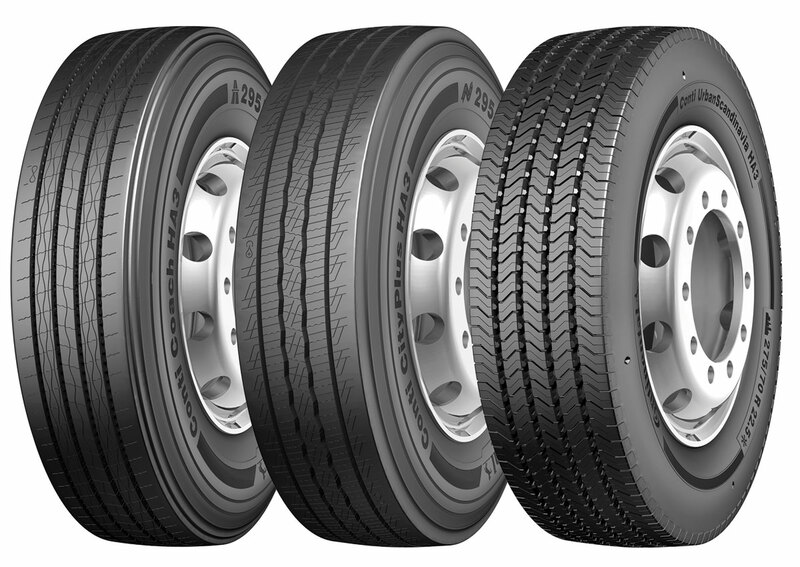 In earlier generations of commercial tyres going back to the 1990s, it was always greater mileage that was sought. Then with the Generation 2 range in 2008/9 the emphasis broadened to include durability and retreadability and in 2010 with the start of the HD Hybrid range, the concern was also with flexibility. The latest generation is Generation 3 which was introduced for trucks in 2014 and a year prior to that for buses, the first time that Continental had offered specialist bus designs rather than truck tyres for bus applications. With each generation of tyres the innovation cycle is shortened. Touring the research facility (where photography is forbidden), we were shown around a number of different sections including Noise Vibration Harshness (NVH), Non destructive tyre analysis and testing, and the R&D tyre carving group. My personal favourite was the section were they produce the tread pattern designs for prototype tyres. There is a multi drilled robot that carves out the tread pattern design on blank rubber tyres for prototype purposes, though the rubber carvers in this area are skilled and could carve the patterns themselves. The robot can carve two patterns at the same time and, because the sharpness of the knife is critical, it stops periodically to check on a camera that it is still sharp enough. The tolerance is 0.2mm. Normally it takes the robot four to six hours but a winter tyre can take ten times that because the rubber is softer and there are about 1,080 sipes on a winter car tyre. Prior to 1996, all prototypes were hand carved. They still carve specialist designs for display purposes, many of which are purely decorative. I had a go at carving a simple side sipe myself and judging the pressure needed, applying it at the right angle and knowing when to stop are all much more difficult than they look. With reinforced sidewalls for city bus applications there is the Conti Urban HA3 which can be supplied as either a 275/70 R 22.5 or a 315/60 R 22.5 and like the other HA3 options can be used on all axles. The Urban HA3 is for steer and drive axles and the Urban HD3 is for applications where more traction is needed. All were designed to offer good ride comfort along with fuel efficiency as well as maximised life through good regrooving and retreading capabilities. On the Urban there are four different wear indicators in two different areas to take account of different height kerb stones. There is also the Conti Urban HA3 265/70 R19.5, a 19.5-inch tyre developed for medium-sized city buses using a newly developed rubber compound. Impressively, as their legally required EU labels show, both the Conti Coach and Conti CityPlus are ‘A’ rated for their wet grip capabilities. The company was the first to achieve this rating. Importantly, technical approval has been obtained from all of the major commercial vehicle manufacturers in respect of the tyre’s performance. While the overwhelming majority of applications can be satisfied with the HA3 range, the company has found that there are some countries, Portugal was one mentioned, where operators have found that the roads they are continually traversing place such demands on the tyres that they are worn out through damage at under 60,000km, well within the normal operating lifespan. For these rare high severity applications Continental believes the Hybrid HS3 truck tyre might be a solution. Incidentally, both Conti’s truck and bus tyres normally expect to deliver similar mileages but bus tyres should not be fitted on trucks because mileage will be lost. Many countries require operators to have winter tyres fitted from October through the winter months and to meet this need Continental developed the Conti CoachScandinavia HSW2, later adding the Conti UrbanScandinavia HA3 and Conti UrbanScandinavia HD3 (drive axle) models in addition to the standard HA3 range. It should be noted that though the range is christened with the Scandinavia moniker, there are many other countries that require their fitment in winter, among them Germany. They can easily be differentiated from other tyres because they have a big snowflake emblem moulded into the sidewall. This is not at all the same as the M+S (mud and snow) emblem which indicates a much lesser winter weather capability. Winter tyres differ from standard tyres in that they are constructed using a softer rubber compound that will not harden until temperatures reach minus 60ºC. The tread pattern is also different with more volume, an optimised block design and advanced siping technology. It was said that winter tyres could increase traction by up to 40%. We weren’t given specific bus and coach figures but in poor conditions a 12 tonne truck braking from 50kmh can reduce its stopping distance from 39.7m to 30.2m if using winter rather than standard tyres. Continental’s entry into the retreading market is a relatively recent one, undertaken to meet the requests of fleet customers for the company to offer a complete range offering under the Conti LifeCycle brand. The new Conti LifeCycle plant within the massive complex in Stoeken suburb of Hannover, was built at a cost of €10m (£7.41m) and created 100 new jobs. It started producing in 2013 and is steadily building up to its full capacity of 180,000 retread tyres annually, of which 150,000 will be hot retreads and 30,000 cold retreads. This year it is anticipated that production will reach 100,000 having achieved 45,000 in 2014. Daily production is around 300 tyres. A limiting factor in the ability to ramp up production any more quickly is the fact that the necessary used casings to retread are a limited resource, especially with regard to 315/80 units. The company is slowly enhancing its portfolio as the different sizes become available, with production of super single trailer tyres set to commence the week after my visit. Only casings up to six years old are accepted. Continental has two separate retread products. The main one is ContiRe, which is a hot moulded retread, while ContiTread is a cold retread product. In price terms, a ContiRe tyre is around 15% less than a new Conti tyre, while a ContiTread is around 25% less. Hot retreads are of a better quality and have the advantage that they can be regrooved, whereas cold retreads cannot be. ContiTread is not currently sold in the UK. We were shown around by Thomas Janicke who began with the reception of tyre casings which are inspected, have a unique barcode attached and have any stones or debris removed from their treads. They are heat tested as well as checked inside and out and photographed within a vacuum at a 45% shearing angle. Roughly 10% of tyres submitted by tyre dealers for retreading then fail the Shearography inspection process and proceed no further, overall approximately 60-65% of casings received back are accepted for retreading. Ensuring the base casing is of a high standard is crucial because Conti offer the same five year manufacturing warranty on retreads that they do on new tyres. Nail holes are not a problem, as long as they are no bigger than 13mm in diameter, because they can be repaired. Once each casing is ready it is stored on a pallet as part of a set of tyres. These pallets are stacked in the casing warehouse. Once a casing comes out of the warehouse it undergoes buffing using an automated computer controlled machine. Prior to buffing a casing can be used for any application, once buffed its use is defined and cannot be changed. Different buffing contours are used for hot and cold retreads. With buffing complete, any necessary repairs are made using special patches before the tyre is prepared. Fresh rubber is applied to the sidewalls and outer casing with different methods used for the hot and cold processes. Curing to ensure vulcanization is the next stage and again there are different processes. The cold retreads go into an autoclave at 112º under pressure of six bar for around three hours. 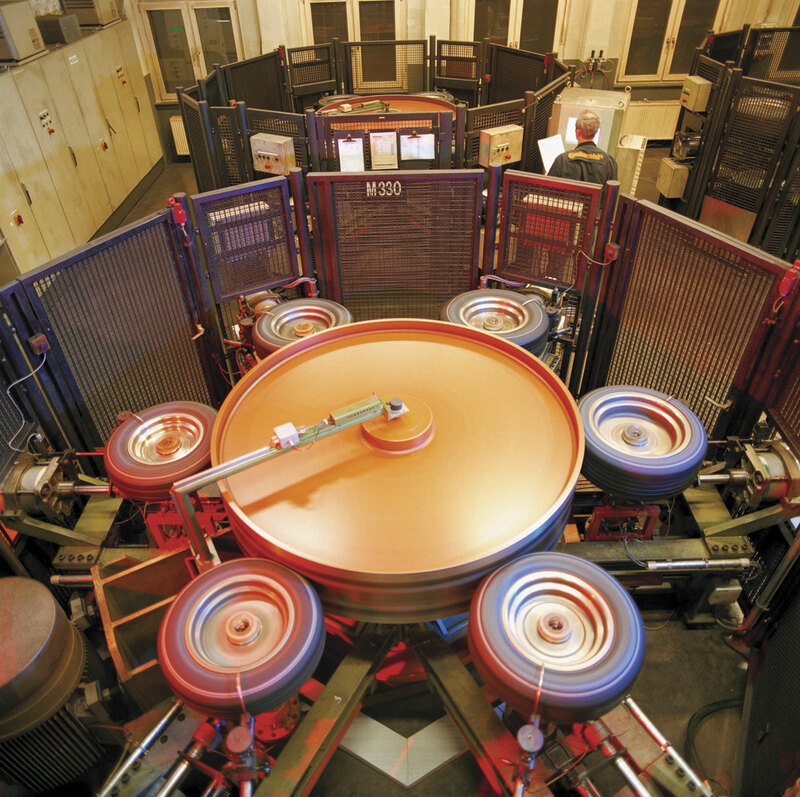 The hot tread curing takes place in a steam heated press at 150-170ºC for an average of 70 minutes. With curing complete, there is a thorough inspection process that includes testing at eight bar and random shearography spot checks. The tyre must look brand new. All test results are stored on the system. Any rubber left over is not wasted. An element of the plant is a 4,000 tonne rubber recycling facility. The recycling plant’s annual material output results in the saving of 2,400 tonnes of rubber, which is the annual production of roughly 1.3 million rubber trees. An example of the way that Continental has utilised other technologies alongside its existing areas of expertise in order to create new products to benefit operators, drivers and passengers is in the creation of the ContiPressureCheck (CPC) system portfolio of products. The impact of underinflated tyres on safety, costs and emissions is well known so the CPC system looks to maximise tyre efficiency. The system has at its core battery powered sensors with radio frequency transmitters, good for a six-year/600,000km life, integrated within rubber casings on the inner liner of the tyre on each running wheel. Each sensor can cope with a -40 to +120º temperature range and pressure of up to 20 bar. Signals from the sensors are received in either of two ways. Either by a central control unit (CCU) that can cope with up to 24 sensors on up to six axles or by a hand held tool (HHT) communicating wirelessly with the sensors and also synchronising the sensors to each wheel position. The CCU learns the location of the sensors by means of a hand held tool and is mounted to the chassis using a bracket. Where the wheelbase is more than 6.0m or there are more than three axles an additional receiver (RX) is also required. A monitoring display (MD) shows the status of the tyres and can issue any of seven types of warning relating to each tyre position. Four different packages are offered offering differing levels of functionality. ContiPressureCheck Light employs the sensors and an HHT to simply make the checking of tyre pressures quicker and cleaner, with no on board display. Conti Yard Reader, due for series production in late 2016, adds a CPC Station within the maintenance area to provide an automatic check of every vehicle within a 25m area and deliver daily data via a web portal report. 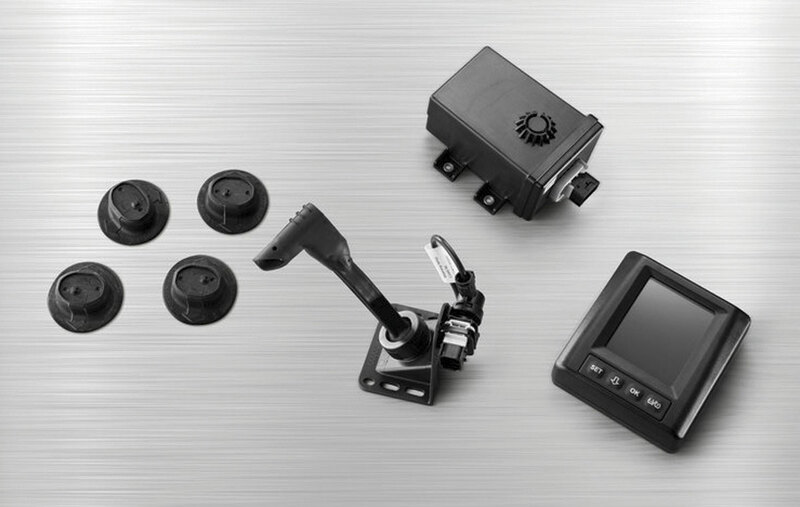 ContiPressureCheck uses the sensors, CCU, HHT and an MD to inform the driver via the MD. It can also incorporate a surrounding observer (SO) facility that alerts the system if any other equipped vehicle in the vicinity has low tyre pressure. Finally there is ContiPressure Check + Connection which connects the CPC system to telematics networks. There are always surprises on manufacturer visits and the one that raised my eyebrows on this one is that Continental is developing tyres made from a type of Russian dandelion that is particularly rich in latex. Called Taraxacum kok-saghyz, the dandelion could be an eco-friendly way of producing tyres in future, though there is still the matter of how to grow enough of them because an area the size of Australia would allegedly need to be given over to their cultivation if they were to be the only rubber source. To date, only 25 passenger car winter tyres have been manufactured using the technology but the first tests with them have been really successful and all the properties the research team expected them to have are present in the tyres. Questioned on the issue, Constantin Batsch said that commercial introduction would not happen quickly and he expected it would probably be 2019/2020 before they could be introduced.